Earlier this year, I walked into J.G.’s office and made a declaration: We were going to Lincoln, Nebraska, for the Tire Rack SCCA Solo Nationals. Making magazines and helping run the company had kept us away from that event for way too long. We were going back, deadlines and workload be damned. He countered with a logical question: What are we going to drive? I answered that I didn’t know and shuffled back to my office. I had magazines to make. By now, you have probably realized that we didn’t have some grand plan that involved winning a national title. No, we were going for the experience. J.G. is a pretty decent shoe and has trophied at the Solo Nats before. Me? Well, I wasn’t hired for my driving prowess, although I can boast of a few local titles. No matter your driving talent, there’s a reality check you have to face: Not everyone is going to win. Yes, there are a lot of classes in autocross, but there are even more entrants—at Nationals, figure more than a thousand participants. Simple math says that the number of entrants greatly exceeds the amount of available first-place trophies. So what’s in it for the rest of us? For one, there’s a chance to see how we stack up. Sure, at home you’re the big fish in the little pond. But how do you fare in a field where Solo legend Mark Daddio finishes an uncharacteristic fourth? You also get to see the cars that are in the magazines–our pub included. The creations unleashed at the event are just amazing. Imagination, fabrication and dedication team up to turn dreams into automotive reality. My favorite thing, in fact, is to walk the paddock in the evenings just to see the craftsmanship up close. Then there’s the community–a chance to hang with people who understand why you spend all day getting heatstroke just for 4 minutes of excitement. Here’s how I see it: It’s not 4 minutes of seat time; it’s a day–or week–of hanging with like-minded souls. I think the sport has matured, too. Back in the day, lots of people seemed to be using autocross as a means to road racing. Today, track events fill that niche. Autocross is still the best way to learn car control and hone your preparation skills in a low-impact environment, but it seems like we now have a sizable population of autocross lifers. This is their sandbox, and they’re happy with that. 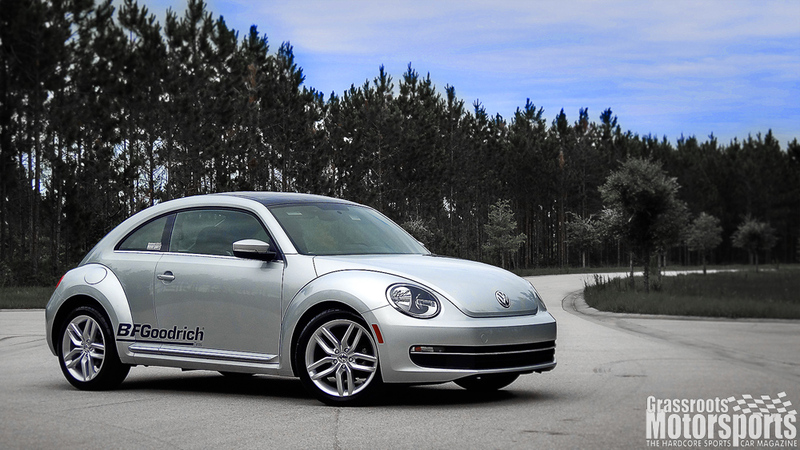 When the time came to register, we did figure out a car: We’d run our VW Beetle TDI in the Road Tire FWD class. In doing so, we’d also become the first people to run a Stockprepared, diesel-powered car at the Solo Nats. Ever. Or at least that’s what some smart people told us. Since we were going with diesel power, J.G. whipped up some special-edition, mesh-back, foam-front GRM trucker hats. He also scored us junior suites for the event. Our car would be mostly stock, but it needed tires. Easy. I ordered up four BFGoodrich g-Force Rivals. It’s just a blazing- fast street tire that’s also novice-friendly. J.G. installed some brake pads and put together our snazzy graphics package. We were off for the races. The first person I encountered at the site was multi-time champ Jack Burns, a gentleman who’s just a great ambassador for the sport. Whether you’re a seasoned vet or a total noob, Jack will answer your questions and point you in the right direction. Next I met our neighbors, the guys from Buzz-Thru Coffee. Did I want something to drink? Those two encounters set the tone for the event, as everyone I met–competitor, official, whatever–was polite and genuinely happy to be there. The locals were pleasant, too. I had a delightful dinner with friendly conversation in downtown Lincoln at LeadBelly, a place described as a “contemporary American pub.” The meal was so good, in fact, that I ate there again later in the week. J.G. and I were in Lincoln on a diplomatic mission. Before leaving for the event, I requested that we have four chairs in our booth. Why the extra two? I wanted people to feel welcome in our space. I won’t lie: Walking back to our booth and seeing guys we didn’t know hanging out in our tent made me smile. For the Tuesday evening movie showing in the paddock, we came prepared, too: J.G. filled the VW’s way-back with every snack imaginable, and that evening we passed them out. And when we had leftovers the following day, we drove around the paddock and handed them out. Chips? Reese’s Peanut Butter Cups? During the week, we ran into all sorts of characters, from legends in the sport to a guy dressed as Dom DeLuise’s alter ego, Captain Chaos. We saw our Central Florida locals as well as guys we haven’t seen in a million years. Bryce Nash, a $2000 Challenge regular, flew out from Oregon and slept in his rental. Many others drove from all corners of the continent to be part of the event. The weeklong experience? Totally memorable. Just before I left for home, I returned the golf cart and then walked through the paddock to get back to our car. The event was winding down, and the paddock was thinning out. The air was quiet. The sky was huge. I came across the Atlanta Region compound–a giant tent filled with used furniture–and grabbed a spot on the couch for a spell. I hung with Perry Bennett–he shoots for us–and Angela Carlascio, a fellow Central Florida autocrosser. Like J.G. and me, she was there for the camaraderie. This was her vacation, and she was there to see friends. And that was the perfect cap to the week–no protests, no stress, no B.S. We just chatted as the sun disappeared beneath the horizon.